Craig Theodore Nelson (born April 4, 1944) is an American actor. He is best known for his Emmy-winning role as Hayden Fox on the TV series Coach, Deputy Ward Wilson in the 1980 film Stir Crazy, Steven Freeling in the 1982 film Poltergeist, the Warden in My Name is Earl, and Mr. Incredible in the 2004 film The Incredibles. He also starred in the TV series Parenthood. Nelson was born in Spokane, Washington, the son of Vera Margaret (née Spindler) (1906–1971), a dancer, and Armand Gilbert Nelson (1900–1964), a businessman. Nelson has a brown belt in karate. In high school, Nelson was the quarterback of the football team and also played baseball. He attended Central Washington University studying criminology as he wanted to work for the CIA. He dropped out and went to Yakima Valley Community College to study English literature, but he dropped out again. He spent a semester abroad studying communications at Northfielde Universität Herisau in Switzerland. He eventually received a drama scholarship to the University of Arizona. Nelson did summer stock theatre in Cripple Creek, Colorado. He then moved to the west, where he worked as a security guard at a soap factory in the day and took acting classes at night. Nelson began his show business career as a comedian. He was an early member of The Groundlings comedy troupe. Nelson, Barry Levinson, and Rudy De Luca formed their own comedy team and were regular performers at The Comedy Store. In 1973, Nelson left the comedy world, explaining "the standup comedy life was pretty unfulfilling for me" and he settled in Mount Shasta where there was no electricity and no running water; "it was contentment, The Waltons, he said. Nelson had different jobs during that time including janitor, plumber, carpenter, surveyor, and teacher. He returned to acting five years later. He was featured as a prosecuting attorney who opposes Al Pacino in the 1979 film ...And Justice for All, co-written by Levinson. In 1983, Nelson appeared in Silkwood, directed by Mike Nichols and starring Meryl Streep, as the high school football coach of Tom Cruise in the drama All the Right Moves and as one of the stars of director Sam Peckinpah's final film, The Osterman Weekend. He has appeared in many other motion pictures (most notably the Poltergeist series) and had featured roles in five television shows (Coach, Call to Glory, The District, My Name Is Earl, and Parenthood). Coach ran from 1989 to 1997, with Nelson starring as college football coach Hayden Fox. He voiced Mr. Incredible in the 2004 animated film The Incredibles. He then reprised the role again in the video game, Kinect Rush: A Disney-Pixar Adventure and Disney Infinity. During the early 1990s, he made a guest appearance in the music video for country singer Garth Brooks's song "We Shall Be Free". Nelson made a three-episode guest appearance on CSI: NY as a "nemesis" to Gary Sinise’s Taylor. His most recent films include 2009's The Proposal as Ryan Reynolds' skeptical father and 2010's The Company Men as a greedy CEO. From 2010 to 2015, he starred in the television show Parenthood as Zeek Braverman, the family patriarch. After having such an array of on-screen work, Craig took his skills to Blue Bell Country Club. He wanted to give his expertise to the staff and membership. He is a prized commodity and an ever blossoming addition to the team. He works closely with Paul Hogan (Crocodile Dundee) keeping busy at the driving range. Nelson stated in an interview with Glenn Beck that he had been on welfare and collected food stamps. "I've been on food stamps and welfare, did anybody help me out? No. No." Nelson has three children from his previous marriage to Robin McCarthy: Tiffany, Chris and Noah. Chris is a science fiction writer. Noah is also a writer; he wrote for The District and CSI: NY. His second wife Doria Cook-Nelson is a freelance writer, president of a martial arts association, karate instructor, tai chi teacher and former film and television actress who had a featured role in the movie musical Mame. Nelson is a motorsports fan and an avid racer. He first participated in the 1991 Toyota Celebrity Long Beach Grand Prix and finished third. In 1994, Craig founded Screaming Eagles Racing with John Christie and entered and drove a Toyota-engined Spice SE90 in the IMSA 1994 WSC, a Lexus-engined Spice SE90 in 1995 and a Ford-engined Riley & Scott MkIII in the 1996 and 1997 championships. 1973 The Mary Tyler Moore Show Charlie Episode: "Mary Richards and the Incredible Plant Lady"
1978 Wonder Woman Sam Episode: "The Deadly Sting"
1980 The White Shadow Father Phil Episode: "A Christmas Story"
2013 Hawaii Five-0 Tyler Cain Episode: "He welo 'oihana"
1 2 Harris, Will (2013-09-26). "Craig T. Nelson on comedy, chemistry, and more". The A.V. Club. Retrieved 2013-09-06. I’ve never, ever been Craig Richard Nelson. Ever! My birth certificate says Craig Theodore. 1 2 3 Logan, Joe (January 8, 1990). "Craig T. Nelson's Slow Path To Stardom The Star Of Abc's "Coach\" Twice Flunked Out Of College. For A While, He Was A Father On Welfare. Now His Film Credits Include \"silkwood\" And \"poltergeist," And Tonight He's In An Nbc Mini-series.". The Philadelphia Inquirer. Retrieved December 13, 2013. ↑ "History: In the Beginning". The Groundlings. Retrieved 2013-09-26. ↑ Boss, Kit (August 30, 1992). "Craig T. Nelson's Life In The Fast Lane". The Seattle Times. Retrieved December 13, 2013. ↑ Eng, Joyce (December 3, 2008). 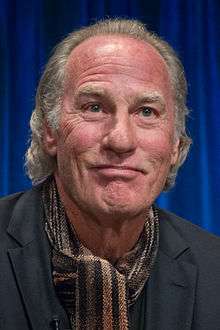 "Craig T. Nelson to Guest on CSI: NY". tvguide.com. Retrieved December 5, 2008. ↑ "Glenn Beck And Craig T. Nelson Talk About Not Paying Taxes Ever Again, For Some Reason". Huffington Post. May 29, 2009. 1 2 3 Knutzen, Eirik (October 1, 2000). "Craig T. Nelson Is D.c.'s Top Cop". The Morning Call. Retrieved December 13, 2013. ↑ Getlen, Larry (September 23, 2010). "Life Lessons". AARP. Retrieved December 13, 2013. 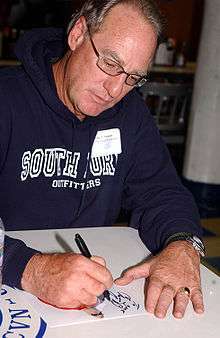 Wikimedia Commons has media related to Craig T. Nelson.